Hi there. I am so excited to bring Bare Skin Facial and Waxing Studio to Downtown Detroit. Since childhood, I have always been obsessed with skincare. My obsession grew into a natural passion for helping people improve their skin. As a graduate from Wayne State University (go warriors! ), I began my career in automotive advertising/marketing. While accomplishing professional goals, I desired to do something more personable that aligned with my passion. A friend suggested I become an esthetician, and that's when my skincare journey began. I went back to school to receive my esthetician certification and license in the state of Michigan. While working at a Russian owned spa, I learned advanced facial treatments. I mastered Brazilian waxing while working at a hair removal company in West Bloomfield. Furthermore, I gained additional experience working at a high-end spa in Grosse Pointe. I've received one-on-one training from educators with some of the top skincare lines including Skinceuticals, Tata Harper, Lira Clinical, and Image Skincare. With all of my experience, I noticed there was still an unmet need for boutique facial and waxing services that focused more on results and less on the fluff. 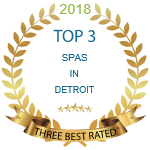 While working in the suburbs I noticed so many Detroiters would leave the city to receive a quality skincare service.Thus came the creation of Bare Skin. I am happy to say that I am born, raised, educated, employed, and now entrepreneur in the city of Detroit. I invite you to treat yourself to one of our beauty services. You deserve it! Cheers to taking care of your bare skin and enhancing your natural beauty! We are located in Downtown Detroit, nearby the newly renovated Riverfront. You can find us inside of the historic Bagley Mansion, 2921 E. Jefferson, Ave, Detroit, MI 48207. Which is also the home of Beautiful Bridal. Guests can enjoy free parking on Jefferson Ave.